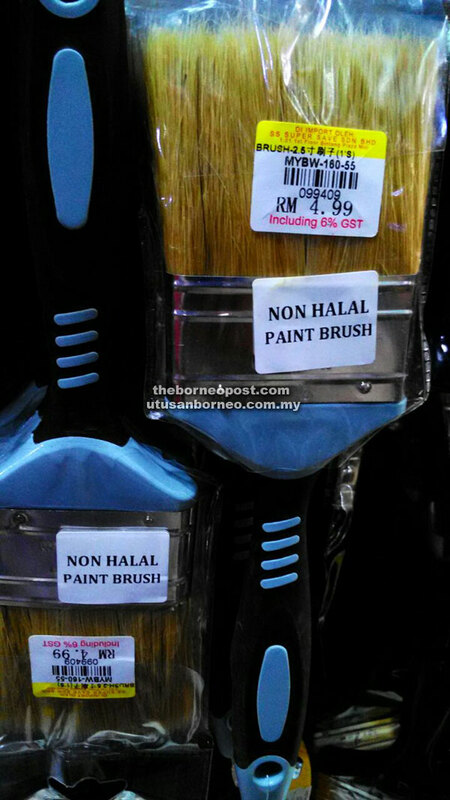 A supermarket in Miri has complied with the regulation by labelling their bristle paint brush made from pig hair as non halal. MIRI: The government should engage and inform shopkeepers and retailers of new laws or regulations on prohibition of sales of certain goods before enforcing them. As they were enacted for the good of the people and not to create confusion, thus should be enforced with prudence and sensitivity, argued SUPP secretary-general Datuk Sebastian Ting Chew Yew. Ting was responding to the crackdown on hardware shops and retail outlets in the state by enforcement officers from the Ministry of Domestic Trade, Cooperatives and Consumerism (KPDNKK) to check for paintbrushes made from pig or dog bristles. The operations were carried out under the Trade Descriptions Order (Item Made of Any Part of Pig or Dog) 2013, which provides for punishment under Section 28 of the Trade Descriptions Act 2011. This regulation requires items made from pig or dog parts to be placed separately from other items in a shop and clearly labelled as from porcine or canine origin. Ting, who is also Piasau assemblyman, said all this should be preceded by sufficient publicity and public awareness of new regulations imposed by the government. “The government must think of the interests of all people – the shopkeepers, consumers, our Muslim brethren, and others – and that is why it should engage and inform chambers of commerce, associations and the people before the law is enforced,” he said. Concurring with Ting, Miri Chinese Chamber of Commerce and Industry (MCCCI) chairman Lee Khoi Yun appealed on behalf of hardware shop owners and retailers to the authorities to give them time and space to comply with this regulation. He said the retailers were in the dark about the regulation despite being in this business for decades until the authorities swooped on them this week. He said that the traders should be sufficiently briefed on the regulation and not immediately punished for their ignorance. “Give them some time to adjust by inculcating awareness among them and not penalising and impounding goods. They will certainly comply now that they know it is required by law,” he said. Lee further said the proprietors would certainly abide by the regulation if given the time to understand it and prepare as they did not want to jeopardise the harmony in the state. “This spirit must be safeguarded as stated by our Chief Minister,” he said. Sarawak Ministry of Domestic Trade, Cooperatives and Consumerism (KPDNKK) chief enforcement officer Abd Hafidz A. Rahim on Tuesday pointed out that under the Trade Descriptions Act 2013, goods made from parts of pigs or dogs can be sold as long as they are displayed separately from other items and labelled ‘Made of Pig’ or ‘Made of Dog’ or any label that has the same message. Labels must be visible and written or printed in a font size not less than 10mm and written in the national language besides other languages and offenders can be fined up to RM100,000 or jailed not more than three years or both while companies can be fined up to RM250,000. Meanwhile, a survey in the city yesterday showed that most of the hardware shops and retail outlets in Miri had started taking steps to segregate non-halal products and putting up labels on hog bristle paint brushes and similar products while some had removed them from the shelves to avoid being penalised by the enforcement agency. KPDNKK Miri branch enforcement officers also inspected hardware shops yesterday, including some in Krokop, but no details on the operation were available. The business community has been rattled by this latest development following complaints by Muslim consumers who want clear-cut labelling to avoid confusion on products origin. Muslim Consumers Association of Malaysia (PPIM) as reported in Malaysiakini yesterday said not only pig bristle paint brushes but all porcine-based products should have ‘logo babi’ (pork logo) to avoid confusion among Muslim consumers, Its president Nadzim Johan claimed that the association had been receiving complaints from Muslim consumers who had accidentally purchased such products, and wants the government to request the manufacturers to label the products accordingly. Speaking at a press conference in Kuala Lumpur, he also said all consumers are entitled to know what ingredients are contained in products before making a purchase. He alleged that food products, footwear, kitchen utensils and certain clothing available in the market also contained porcine elements.